"My old roommate, who was Latino, gave me this recipe about 8 years ago. Recently I was cleaning out a cookbook and found the recipe tucked away. This is extremely delicious. I don't know what it was called, she just said it was something her mom used to make when she was younger. Depending on how spicy you like it, you omit or ramp up any variety of hot spices you like. This is great served over rice with shredded cheese and sour cream -- or even with corn bread. It is really versatile." 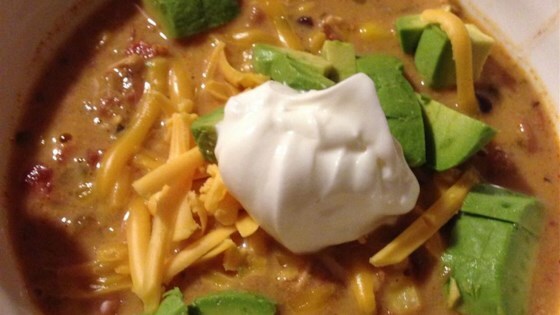 You can certainly use this recipe as a base for incredible creamy tortilla soup too. Using one of those pre-roasted chickens or turkeys from your local grocery, shred and place in the bottom of the cooker instead of chicken breasts. husband said "if it's easy, it's a keeper". It was! This coming from a guy who's not a fan of Hispanic dishes! Yum! Thanks! We did take out some of the liquid and served over rice.